LAAX - Flims Laax Falera, an experience in the purest sense. Because LAAX - Flims Laax Falera has so much more on offer for everyone. Because LAAX - Flims Laax Falera isn't just a ski resort. 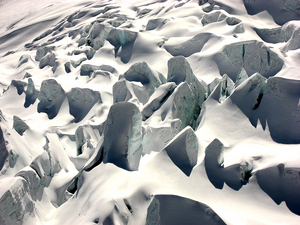 LAAX - Flims Laax Falera will make all your Alpine dreams come true. There's something to satisfy everyone's wishes here with a wide selection of services to choose from, from mountain-side restaurants to places where you can rent the latest ski gear to accommodation. An integrated source of Alpine winter experiences. The LAAX winter resort in Graubünden, made up of the villages of Flims, Laax and Falera, is run and marketed by the Weisse Arena Gruppe, an organization which grew out of the merger between the ski-lift and cable car operators Bergbahnen Crap Sogn Gion and Bergbahnen Flims in early 1996. The group now boasts five 100% subsidiaries in the following sectors: ski lifts and cable cars, hotels and restaurants, ski/snowboard hire, ski/snowboard lessons, and management; as well as participations in the Flims Laax Falera tourism organization, in Startgels AG and in Finanz Infra AG. This has made the Weisse Arena Gruppe a successful and multi award-winning, integrated service provider in Alpine winter experiences. 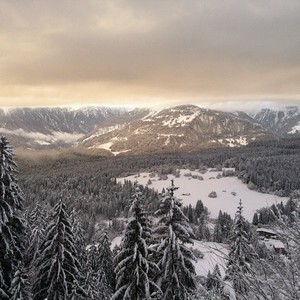 LAAX, the embodiment of your winter dreams. As a destination, LAAX is all about individuality. Younger visitors and the young at heart can enjoy the unbridled freedom of LAAX's freeride snowing or the snow parks, whilst families can take their little snow acrobats along to the three kids' villages. Skiers of all abilities and all ages can benefit from lessons at our excellently organized ski and snowboard schools on the most fabulous slopes and accomplished skiers in the making can learn how to put the finishing touches to their techniques. LAAX embodies a youthful, dynamic zest for life and offers quality and service of the highest standard. Boasting the Vorab glacier the LAAX winter sports resort, 70% of which is at an altitude of between 2,000 and 3,000 metres above sea-level, is amongst the most reliable places to find snow in the Alps. 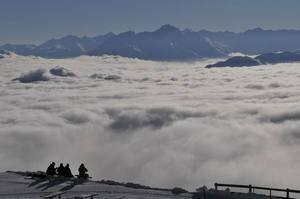 As a result, the winter season starts in LAAX as early as mid-November. The five lift facilities which carry skiers from the three base stations up into the winter sports area reduce waiting times and offer passengers all the latest comforts. LAAX boasts over 220 kilometres of varied piste, 25 of them covered with artificial snow, and over 27 lift systems with the capacity to transport in excess of 40,000 passengers an hour. The expansion of the snow-cannon facilities means that visitors to the region can enjoy even greater convenience. Since the start of the 2007/08 season, there have been four valley runs available where snow is guaranteed, enabling visitors to enjoy the runs down to the base stations in Flims, Laax and Falera all winter long. What's more, the piste leading down into Laax has been kitted out with a new piste-lighting system, allowing night-time descents. 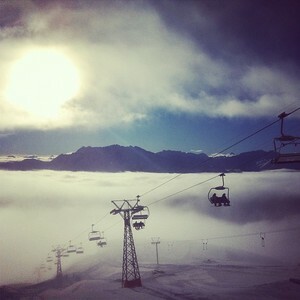 We had our eye on Laax for quite some time, but it was the first time we actually made it. Like most resorts around Chur (we've been to Davos, St Moritz, Arosa, Leizenheide), it is super easy to get here by train/bus from Zurich and takes about 2hrs30mins from Zurich airport. This is the same time it usually takes us to drive from Geneva to the Three Valleys, but much more comfortable. We found all the locals, from the hotel hosts to restaurant waiters/chefs to bus drivers, extremely polite and friendly. Our perception had been that this was mainly a snowboard resort with no flat runs, but we could see some flat bits where beginners got stuck. However, for intermediary boarders and above it's not really a problem. It was interesting to see that the majority of people are skiing, so don't be put off if you are a skier and think it's a snowboarders paradise, not great for skiing. 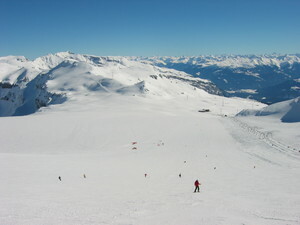 The ski area is fantastic, with a fair variety of slopes, from blue to black and excellent off-piste almost everywhere. It's not huge, and we did pretty much all the runs on the Saturday and hardly found any new ones on the Sunday (except the Falera area, which we never got to), but could have easily stayed for a couple of days more without getting bored with them. The runs are very well connected by a combination of chair lifts, bubbles, gondolas and some drag lifts, so you don't need to watch the clock too much if you are in the opposite corner of the piste map and need to get home on the last chair lift. It snowed on Friday and was sunny all weekend, so we were lucky with the weather, but even on Sunday afternoon, we were finding plenty of untracked powder everywhere. The snowpark is the biggest we've ever seen, with some kickers the size of a two storey house, a massive half pipe and rails etc. Many of the blue/red runs have natural kickers in them, making them great fun to ride. The runs are well groomed and maintained and the restaurant options, both on the mountain and in the villages, are quite good with good variety. The slopes were quite clear and sometimes we had the entire piste or off-piste to ourselves. Bizarrely, despite few crowds on the slopes, there were long queues almost at every chairlift or gondola most of the weekend. Perhaps, it was a busy season. 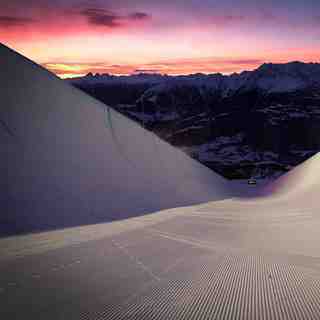 We found that the INSIDE LAAX app was very good. We got our lift passes on it (with a slight discount to the face value and no need to queue up) and it had some interactive functions. It could have done with a pdf piste map though, as the interactive one is not always great to read and requires data usage, which is not always good on the mountain. What was great though was the availability of Laax WiFi at every station or restaurant on the slopes, which requires no log in and connects automatically; this is not that common in the Alps. The village of Flims is neat and tidy, a bit quiet away from the main lift, but has a couple of really good (if sometimes expensive) restaurants, as well as a couple of budget options like a pizzeria. Our hotel was a 10 mins walk along the road, which is quite flat, so no problem at all. What has been a problem is the lack of snow: the locals say that they haven't had a white Christmas for four years and all the Friday snow was gone at the village level on Saturday morning and that is in the middle of February! On the other hand, there are excellent snow-making facilities, so we didn't come across much ice on piste and generally felt that had it not snowed on Friday, we'd just stay on piste and still enjoy the runs. The Laax village has a distinctive taste to it, with a new stone-clad buildings around the main station and a snowpark centre (we always want to come here in the summer; maybe this year??). There is also a lake, which is supposed to be quite good for swimming in the summer, so another reason to come here again. All in all, definitely a resort we'll be coming to regularly, just hope that the climate improves to make it more snow-sure. Lesen Sie 18 andere Beurteilungen ueber Flims Laax Falera oder geben Sie Ihre eigene Bewertung ab.